It is often said that financial markets go up stairs, but down escalators and today was a good example of this in equities. Throughout October, markets like the FTSE 100 spent a lot of time grinding their way higher, only for these hard fought gains to be wiped out in a couple of days. After making fresh new highs for 2009 in October, most major indices such as the FTSE, S&P500 and Nasdaq are now in the red for the month. Financial markets have had a phenomenal run since the low points of March, but now investors are taking their gains and running to the safety of the sidelines. The main catalyst for the sell off yesterday was a surprise fall in US new home sales. However, the door to a slump was already open by the time this came around. In this ‘safety first’ climate the yen is the favoured home for people’s money. 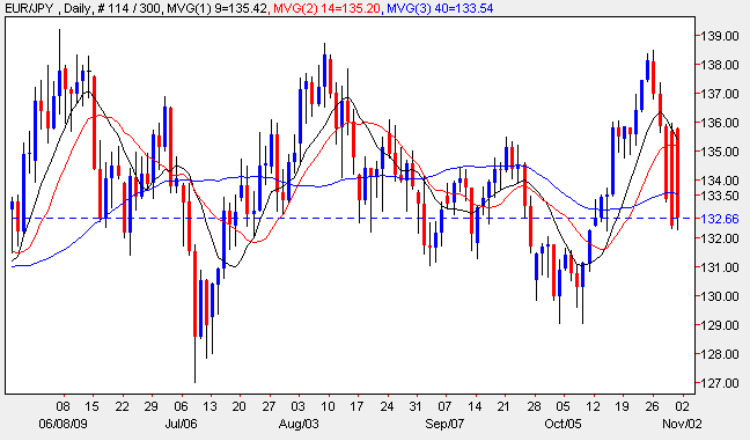 Yesterday, the euro and Australian dollar were well and truly smashed against the yen in particular. The sell off has shown no abatement today either with the EUR/JPY and AUD/JPY amongst the biggest fallers in early trading. Aside from the yen, the US dollar is holding up reasonably well and the British Pound is holding its own. Many of the key trends from last week have been reversed with surprising aggression. The New Zealand dollar against the US dollar (NZD/USD) is a good example of this. So if you’re looking for some action today then those currencies going from hero to zero may be your best bet. You can find most of these in the hot list below. The Euro/ Japanese yen pair (EUR/ JPY) has now reversed nearly 60% from of its move from the start of October in just four trading days and is holding around the 133.00 level. If the EUR/ JPY is going to pause, this technical level might be as good a place as any. A double (up) trade might be a good way to play this. Today’s major economic announcements both come from the US at 12.30 GMT. First we have the latest GDP figures which are widely expected to turn positive, indicating a return to growth for the first time in over a year. Will there be any shocks as with the recent UK GDP figures? Secondly we have unemployment claims which are expected to show a slight dip on the previous announcement, indicating the unemployment situation is improving in the US. Watch out for the reaction to these announcements on the Dow Jones and US Dollar pairs like the EUR/USD and GBP/USD.